I haven't posted for months. But I have been knitting. A friend had a baby at the beginning of May so I made him a baby Yoda cardigan and am now on the hood part of the striped hooded top from Debbie Bliss's Baby Cashmerino book. 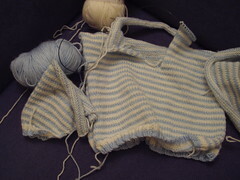 I'm using ordinary DK baby yarns (i.e. ones I can afford rather than the cashmerino) and it seems to be working out really nicely.